AAC-WIN - Windows Software Bundle. There are 2 types of file that reside in the device that can be exported or imported. The app.sab file contains a list of all the components that reside in the device. The kits.scode file is the file that defines the functions that a component can perform. Initiate a connection to the AAC-1000 from the Engineering Tool. Available devices are listed in the tree of the engineering tool by their IP address or computer name. If the device is not in the tree then select File - Open to initiate a connection. 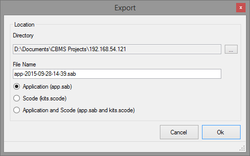 Select file - export from the menu to display the export dialog shown to the right. There are 3 options for saving the app.sab file, kits.scode file or both. 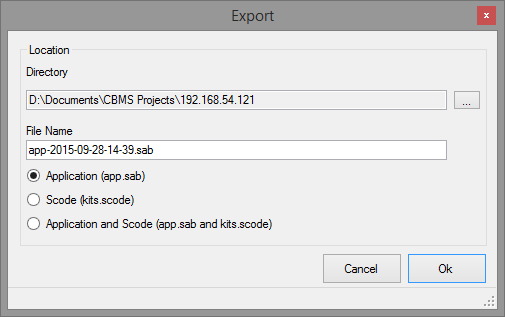 Select file - import from the menu and then select the name of the file you wish to import.